Welcome To Day 12 Of Baking With Pumpkin! It was so beautiful and cold out today! I know it sounds so weird but it was a happy feeling to be cold. The sky was blue, blue and just so gorgeous out. I could have baked all day! Today we went out in town to some Japanese stores. I am working on and trying to finalize my design for our Holiday Party (Christmas Party) centerpiece. It has proven to be a little difficult here and there. It was nice to get off base and stop by one of my favorite Japanese grocery stores, Universe and get some bread. We also always look for some new odd or strange Japanese drink to try…we found two today and they both ended up being amazing. One was called “Fruit & Salt” and the one I grabbed was all in Japanese so I don’t have a name to share but it had a lemon on the bottle with a bear and honey. Good stuff. 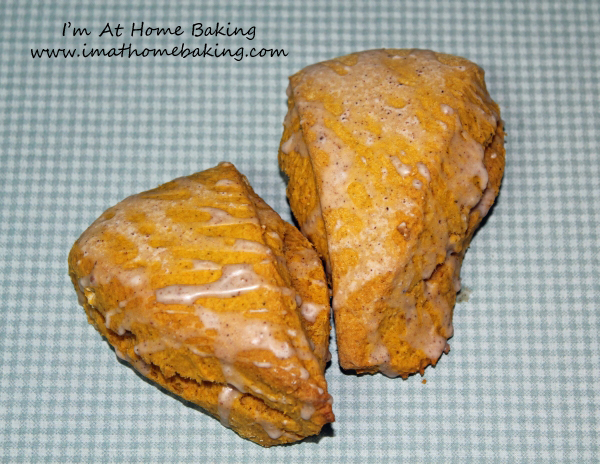 Have you ever tried the pumpkin scones at Starbucks or any bakery? I have and they are pretty tasty. I always love though when I find a recipe that is pretty much a spot on copy, that way I can make it at home and use what ingredients I want. These are amazing scones. I chose to leave the “plain glaze” off of mine as I just really wanted them simple and I wanted to really taste the pumpkin. However I did drizzle some spice glaze, was just perfect. They are even delicious with no glaze at all and remind me of a plain baked pumpkin donut. Preheat oven to 425 degrees then line a baking sheet with parchment paper and set aside. In the bowl of a large food processor (or in a large bowl) combine the flour, sugar, baking powder, salt, cinnamon, nutmeg, cloves, and ginger. Pulse or whisk to combine. Add cold butter and pulse until well incorporated and mixture is the texture of cornmeal. Alternatively, use your fingertips or a pastry butter to blend butter in. In a separate bowl, whisk together pumpkin puree, half & half, and egg. Add to flour mixture and pulse until just combined. Alternatively, stir until the dough comes together in a ball. Turn the dough out onto a lightly floured surface and gently knead 4 or 5 times to bring the dough together, then flatten into a circle 1″ thick. Using a pizza cutter, cut the dough in half, then cut each half into thirds. Place the wedges onto the prepared baking sheet and bake for 14-16 minutes, or until just starting to turn golden brown. Remove to a cooling rack to cool completely. When scones are cool, whisk together the plain glaze ingredients, then spoon on top and spread slightly. Let harden for 10 minutes, then whisk together the spiced drizzle ingredients and drizzle on top. Let harden completely, about 1 hour, before serving. Store in an air-tight container for 1 day.